Grandpa was busy finishing up his travel itinerary. "Many places! I want to visit places that are charming, historical--"
"exciting, sunny, special--" he continued. "Ok, ok. Where are you going?" Flashing a list of places in his hand, he said, " Figure it out yourself"
" I am starting my trip from Africa late summer, not before. Then to the land of beautiful mausoleums!" He finally stopped.
" And then?" I asked looking at his list. "You figure that out son. I will end it on Thanksgiving"
" And son, yes there is a method to my travel plan!" He muttered. I was looking at his list. Is there a method to his madness? What places is he visiting? Why? 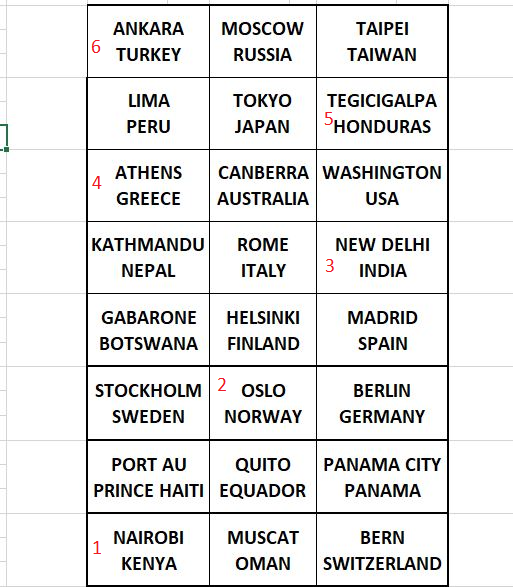 Nairobi, Kenya; Oslo, Norway; New Delhi, India; Athens, Greece; Tegucigalpa, Honduras; and Ankara, Turkey. Kenya is in Africa. Oslo is where the Nobel Peace Prize is awarded, which the three listed organizations all have won. India is known for mausoleums, including the Taj Mahal. The last stop in Turkey references the popular Thanksgiving bird. The places form a knight's path, and the initials of the countries spell KNIGHT. Where are you going on holiday, Julian?